Gum disease, also known as periodontal disease, is the leading cause of adult tooth loss. Gum disease doesn’t just affect the health of your mouth – it also can affect the rest of your body. Research has shown that periodontal disease is associated with several other diseases, including diabetes, cardiovascular disease, osteoporosis, respiratory disease and cancer. We use advanced dental technology to effectively treat gum disease here at our office. We combine gentle ultrasonic gum therapy, deep cleanings and antibiotic therapy to fight gum disease. We also offer expert gum disease prevention education. Over the decades our advanced gum care has saved many of our patients from needing gum surgery. The American Dental Association states that 80% of Americans have some form of gum disease. Regular, thorough cleanings are the first line of defense in preventing gum disease. They are also the foundation for good oral health. 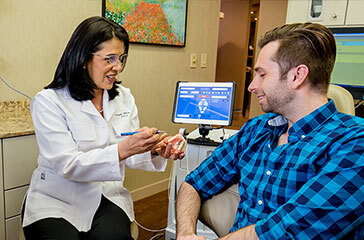 We design a soft-tissue management program for our patients with gum disease. Our Prodentec Soft Tissue Management® program involves a new method of cleaning patients’ teeth. We use Pro-Dentec for gum and soft-tissue care because it combines ultrasonic cleaning with antimicrobials, disinfectants and desensitizing solutions for better patient safety and comfort. This method has many advantages over the older cleaning methods that use heavy vibration, leaving teeth feeling sensitive, gums sore and mouths numb. It does not dig into your tooth structure. But it still provides a thorough and gentle deep cleaning of the tooth surfaces. Scaling and root planning are the initial treatments for mild to moderate gum disease. Scaling, the first step, is removing tartar from your teeth. The procedure is performed using an ultrasonic scaler, which will gently strip deposits from your teeth and roots using ultrasonic waves. Next, we’ll carefully plane the root surfaces to avoid future tartar buildup. Smooth root surfaces let your gums regenerate without irritation and bacteria cannot adhere to smooth tooth roots The gum tissue shrinks and tightens around the teeth, since the irritant has either been reduced or eliminated. Dr. Alidadi uses the LANAP procedure to treat gum disease quickly and effectively. 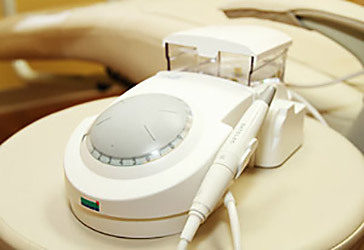 LANAP (Laser-Assisted New Attachment Procedure) is a safe and effective method of treating gum disease. The LANAP procedure uses a soft tissue dental laser to remove infected tissue and inflammatory debris from inside your gums. The laser doubles as a disinfectant, since it also kills the bacteria on your gums. Additionally, it seals your nerve endings and promotes healthy gum regeneration. The LANAP procedure can be done in a couple of appointments and is relatively quick, whereas scalpel surgery usually requires four sessions, plus more visits for suture removal and additional check-ups. Rather than weeks, recovery time with LANAP is very fast, and most patients may only need to use an over-the-counter pain reliever for any discomfort for one or two days. Bacteria cause gum disease. ARESTIN is an antibiotic that helps kill the bacteria at the root of the problem. Dr. Alidadi places ARESTIN in infected gum pockets below your gumline. Because it is placed right where you need it, this makes ARESTIN different from an antibiotic you take orally, in pill form. ARESTIN contains microspheres—tiny, bead-like particles—that are not visible to the eye. These microspheres release the antibiotic over time, killing bacteria so your gums can heal better.